in the near future. Behman agreed. and tantrums from George and Ethel (she never backed down from George). pregnant. On August 26, 1900, Ethel gave birth to their daughter Georgette. 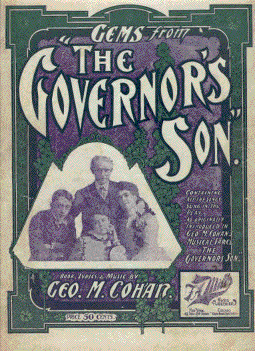 now set his sights on bringing an expanded versions of "The Governor's Son"
word that the union considered his show outside the boundaries of the strike. 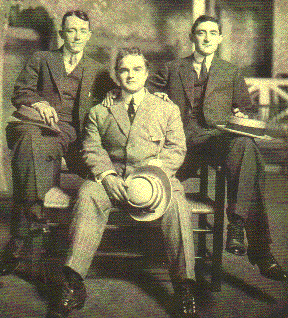 original cast of "George M!" 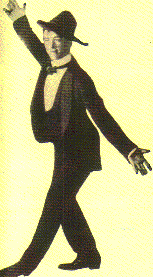 In an interview (circa 1904) George relays his feelings toward vaudeville. about - right out loud." ones where he was happiest. optimistic as they toured the country. ("I Want To Hear A Yankee Doodle Tune" and "Always Leave Them Laughing"). 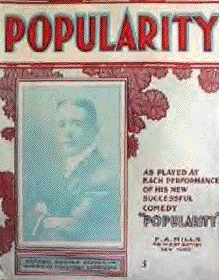 reputation as a monologist in vaudeville, had no opportunity to display his talent. He looked the gentleman he is, however." 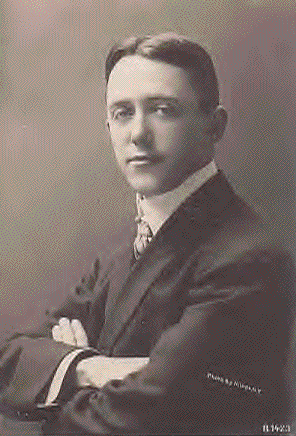 his discoveries was Mary Pickford). Harris complimented Cohan perfectly. production might have during rehearsal. 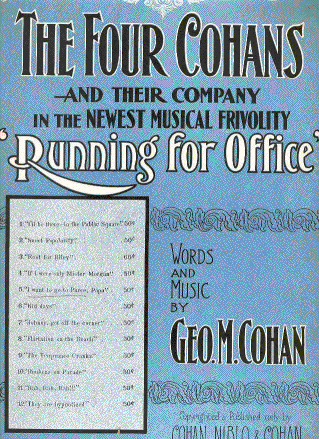 The team of Cohan and Harris would prosper and last until 1920.
starred himself and his family. on the set of "45 Minutes From Broadway"
in 1906. But with all his professional success, his personal life was in chaos. had fallen in love with the chorus girl, Agnes Nolan, from "Little Johnny Jones,"
unfaithfulness in February of 1907. 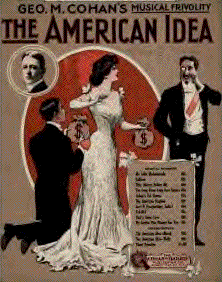 "The San Antonio Song" (1908), and Broadway shows like "Nearly A Hero"
to appear in "Marinka" (1945) on Broadway . 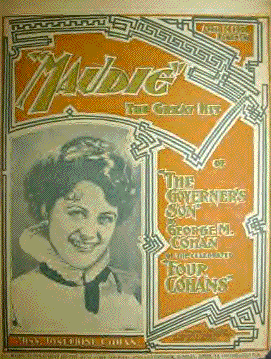 She lived until 1955.
one of Cohan's few ragtime songs. With Ethel now a part of his past, George was free to ask Agnes to marry him. after a hard night at the theater. to reprise his role of Kid Burns. In his next show, "Fifty Miles From Boston,"
American playwrights as Harrigan's name has meant to me." 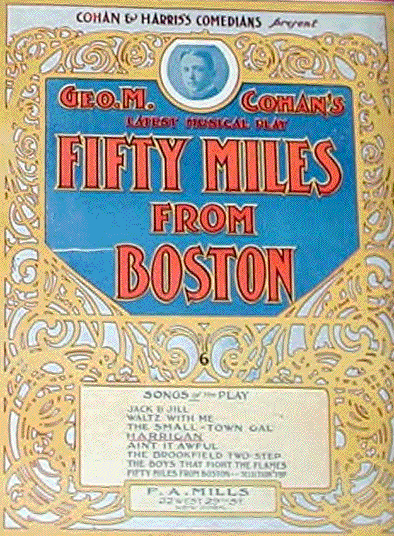 It is also of note that in 1911 Cohan chose a song from "50 Miles From Boston"
to record for RCA Victor entitled, "Small Town Gal." "Honey Boy" Evans, and female impersonator Julian Eltinge. & Harris knew they had a winning combination. stardom (much like his father's) was the main reason for the show's success. do I contemplate marriage." It was great publicity. decade would take them even higher. 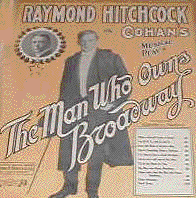 "The Man Who Owns Broadway"